The Clyde and Pentland Firth have met in an arts project held in Ormlie Centre in Thurso. The event was organised by Jennifer Ironside of Key Housing and ran in conjunction with Project Ability who are a Glasgow based visual arts organisation. Three artists, accompanied by four artists who have learning disabilities travelled north to Thurso for three day workshop and to meet up with seven of the service users of Key Housing. The theme of the workshop was living by the sea based around the shipbuilding of the Clyde and that fishing boats of the Pentland firth. Material from the workshop will go forward to an exhibition to be held in Glasgow later this year. 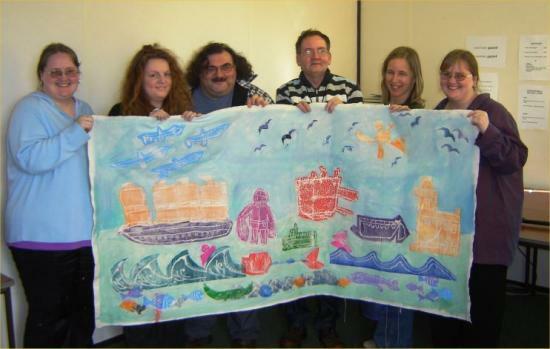 This is the second arts collaboration between Key's Thurso artists and Project Ability. Last year George Davis and the later Ian Sutherland took part in producing a collage of a Steven's lorry which is still touring the country and is at present on display at the transport museum in Glasgow.